You’ve’ given up on Code A to focus on rehabilitation. How are you lately? I play soccer with the players at the training house and play games that I wasn’t able to before. I also went home which I haven’t done in a long time. I am having a relaxing time. I can’t play games that need me to use my right hand. I play mostly ‘Troy’ these days. Troy doesn’t need me to use my right hand or the mouse almost at all. I enjoy some other games occasionally as well. How is your condition at the moment? I am going through rehabilitation at the hospital consistently. To make it simple, it’s a problem with my spine. Other than that, there is inflammation and I have pain at my wrist, back, neck and everywhere else. Consistent rehabilitation is more important than anything and adopting a correct posture is crucial too. So I keep going to the hospital to get treated and keep working on fixing my habits at home. How long will the entire rehabilitation take? I can’t set a date right now. I will have to keep at it and see how it progresses. I will know once I’ve worked at it for a while. Frankly, if you consider your age and other things, it’d be no surprise if you had thought about retirement. What is your reason for choosing rehabilitation to extend your player life? I want to leave while the fans are applauding me. (there may have been a chance like that in the past). That’s the reason I started Starcraft 2. I feel that it is my duty to at least stand on the stage of a finals for the fans who have stuck with me so far. The result of the finals doesn’t matter but I will only retire once I have stepped on the stage at least. Right now, the rehabilitation comes first and once I am healthy, I will keep challenging myself with that goal in mind. 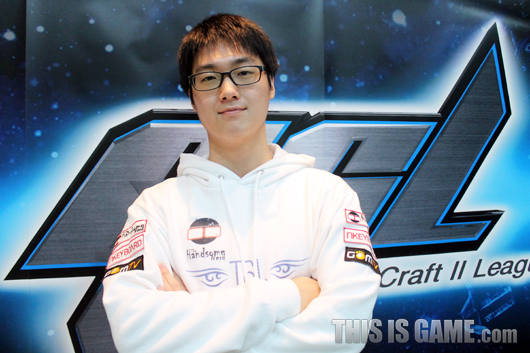 Lately, there has been talk of Starcraft 1 teams switching over to Starcraft 2. I am aware. I’ve also heard that Starcraft 1 and 2 may run in parallel. I acknowledge that Starcraft 2 gamers are working hard but it seems as if they want the game all to themselves which is disappointing. Even the fans are divided on the issue and keep fighting which is saddening. eSports needs to grow as a result of Starcraft 1 and 2 fans coming together. We’ve come to a point where a decision needs to be made based on a broad viewpoint. I hope everyone comes together and gets along. Isn’t that what the fans want too? Starcraft 2 teams are worried about the switching over of Starcraft 1 teams. What about SlayerS? I told the players to pay no attention and keep concentrating on the game. Our players focus on the game regardless of external factors. There will be both good and bad things as a result of the switch. It’s not possible for me to say much more yet. A few days ago, it was announced that you are getting married within the year. 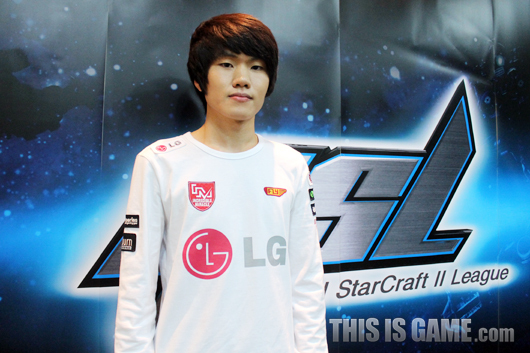 It’s been a while since you played in the GSL. How do you feel? I prepared for the match as if it were my first time and worked hard. I am very happy about the win. You don’t seem satisfied with how you played today. I am not happy with Set 2. I didn’t anticipate my opponent opting for such a greedy build. I am not happy about failing to anticipate my opponent’s build and falling behind as a result. Initially, I thought he would be a pushover. However, in the process of studying him, I found that he’s actually good. That did make me slightly nervous. 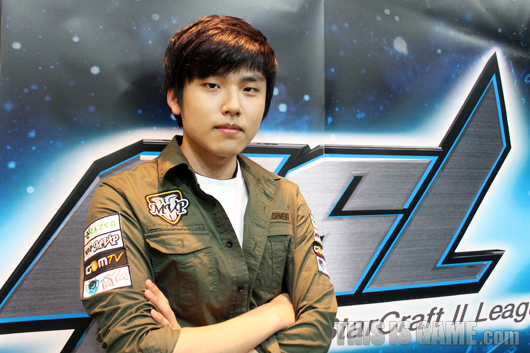 Maru is doing quite well in Code S lately. I do envy the fact he’s in Code S but it’s okay since I’ll join him soon. We don’t compete against each other. 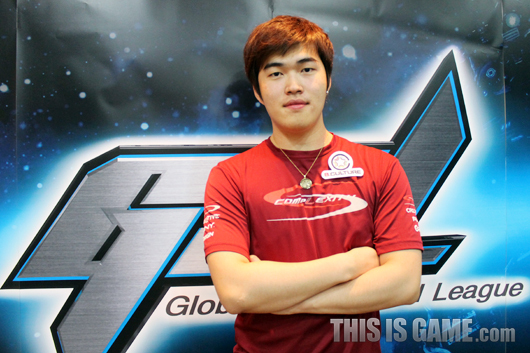 I think Maru is a fantastic player. Will you get into Code S this season? I will get there one way or another. Protoss is in a good place lately and my practice is turning out well. Who do you wish to face in Round 2? I face either SlayerSPuzzle or IMTrue but I don’t know either of these players. I do favour PvZ so I hope I face the Zerg. It seemed like I would win and I had confidence. However, Nada prepared so well. I think I was too arrogant last season. How do you feel about advancing to Round 2 of Code A? I feel great. Back in Code S, I believed a win in Code A would be dull but now, it’s not like that at all. I’ve been losing so much lately that today’s win feels better than ever. You were seeded straight into Code S but got eliminated in last place in ro32. At the time, I had just attended IPL 4. I think I failed in taking care of myself. The jet lag and the fact that I’m older than my opponents seemed to take a toll (laugh). We haven’t seen you win anything in both GSL and GSTL lately. I don’t feel that my skill level has dropped. However, while attending so many foreign tournaments, I think I’ve forgotten how to prepare for the GSL. I’ll have to remind myself. Your match today was 2:1. You began by dropping the first set. I thought to myself: is this how I get eliminated? Then in Set 2, after some heavy pressure, I won after defending. After Set 2, I was well warmed up so I knew I could win Set 3. How is your TvP lately? Protosses seem to be strong of late. It’s still my best match up. Honestly, Protoss is a little bit strong. However, I just played poorly in ro32 Code S. Having said that, I see Terrans lose because Protoss is stronger from time to time. I think this season’s results will determine the state of TvP. Your next opponent is either Ganzi or Guineapig. I prefer Guineapig since he’s Protoss. 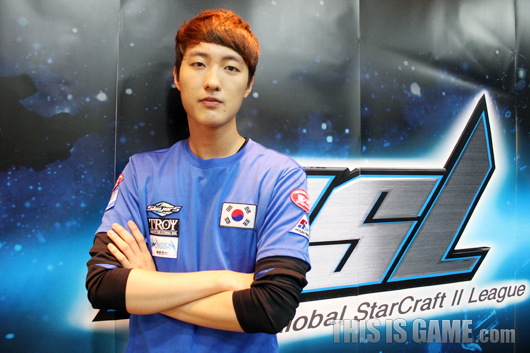 'Polt' was a name you expected to always see in Code S. Will you return? I received a seed this season but I did go to the preliminaries. Since I’ve been to hell and back, I won’t become lax and work hard to get back into Code S.
What is your plan for foreign tournaments? I will decide based on GSL and GSTL schedules. I will put GSL first but also attend foreign tournaments occasionally. I want to thank TSLPunisher and TSLCenter who helped with practice. I hope Protosses in ro8 Code S do well. There haven’t been any matches since the last Up and Downs. How have you been? Having the Code A match on its last day meant that fitting in practice was hard. I fooled around for about two weeks at first. I went clubbing and travelled overseas too. I joined the MVP training house about a week ago and started practising for the match. Did the two weeks refresh you enough? Breaks are hard to come by and using all of it for practice would’ve worn me out. I let go of the mouse based on that reasoning. I will practise for each and every match with the intention of winning from now on. You haven’t shown any results since joining Complexity. You must be under some pressure. There is a lot of pressure. Even discounting the new team, there is pressure I place on myself. I keep getting older but there is no major result to show. I’ve made a new determination before starting this season’s Code A and I’m feeling good. I am playing with the thought that this is my last chance. Do you plan to continue practicing at the MVP training house? I don’t know when I’ll be leaving but for a while I will stay there. It’s been a great deal of help, a lot of it involving gameplay. Even today’s build came from MVPTAiLS. Other race users helped me like it was their own match too. The atmosphere of the team is fantastic. I happen to be one of the oldest but that’s not a problem at all. Since we practise under the same roof, I try to approach them like I belong. You ended the match quickly today. I was lucky and the fact that I’ve been trying to adopt a new style helped too. I’ve observed that I never tend to put on the initial pressure. So I’ve been practising builds where I try to get ahead in such a way lately. I want to be a player who can play his opponents psychologically as well. You fell from last season’s Up and Downs. I was in Code S for almost a year and not making it back made it feel like something was taken from me. However, I wasn’t desperate enough. I didn’t prepare to the best of my abilities and was lax. After making a determination to really play the game seriously, I was motivated. I am blazing hot right now. In terms of gamer age, I’m one of the elders so I am as serious as can be. You will witness a frightening Killer from now on. You take on forGG in Round 2. I lost a game to him in Up and Downs once. I faced him many times in Starcraft 1 as well. I want to have my revenge for the loss in the Up and Downs. I’m not one to live with a loss. Lately, all Terrans seem to be about the same. I will be on guard with the thought that even the slightest mistake can cost me the game. My experience in the MVP training house was one I’ve never had before. I am grateful that all the players welcomed me even though I’m much older and look scary. Thanks to that, I got used to the place very quickly. I also want to thank Coach Choi who allowed me to stay at the training house. I want to tahnk the MVP Protosses who helped me come up with builds for today: TAiLS, finale, Vampire as well as other members who gave me a lot of advice. How does it feel to advance to Code A Round 2? I’m just glad I haven’t dropped to Code B. I am satisfied. You fell from Code S last season in last place of ro32. After falling to Code A, I thought I would get back into Code S easily but I had a mental breakdown in Up and Downs and failed. I plan to change in the future. I will improve both my play and mental state enough to win the championship. What was the biggest problem in the Up and Downs? When the bracket was released, I thought I would get back into Code S and even on the day, I was expecting to advance after taking two early wins. But I became scared after losing my third game. This fear ruined everything. You must have been nervous about today’s match. I told myself to stay strong regardless of whether I advance or fall to Code B. So I was at ease. Golden played better than I anticipated. I felt a lot of things after the match. You began by dropping Set 1. Were you not warmed up yet? It was a map I lose on often in practice. I played the game out fairly well but the end game wasn’t handled properly. So I got overtaken. 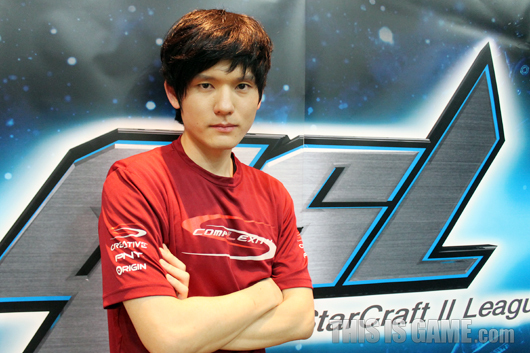 You face Nestea in Round 2. Last time, I was so greedy about winning but this time, I plan to give up some of that greed. I am trying to changed outside of the game as well so what’s more important is how I prepare and what kind of mentality I bring to the games. I do have confidence that I can win. Are you confident about making Code S this season? Even if I take down Nestea in Round 2, I meet MMA in Round 3. It’s a hard bracket but on it all depends on how I deal with things outside of the game. I don’t think I’m behind skillwise. I want to thank teammates who helped with practice. I want to thank our partners MYM and sponsor Razer. It was a close call. You must’ve been nervous about dropping to Code B.
I was quite nervous about dropping to Code B. However, my opponent is in the same situation so I tried my best to stay calm. The games turned out well like in practice. You fell in last place in ro32. It’s been a long time since I was eliminated. I just didn’t expect falling straight down to Round 1 like this. The shock was huge. I’d practised a lot too (laugh). Still, my ‘hyungs’ helped me recover quickly. On the same day, Ryung fell in third place of the same group. This was your first Code A match in a long time. After winning my game in Code A, I never played in the first round of Code A. I was under a bit of pressure since my opponent was True who has just gotten into Code A. The last time I was in Code A, I was against MMA where I was the underdog which made it much easier for me. Protosses are on fire at the moment, what do you think when you look at the ro8 players? I seem to be falling behind the trend. I could have been one of the ro8 players, it’s regrettable. What do you think about the Protoss OP theory of late? Definitely not. Like David Kim said, the balance is perfect (laugh). My PvP is turning out well lately so it should be okay. Do you think there is a high chance you will make it back into Code S? I think I can go straight into Code S as long I beat Creator. 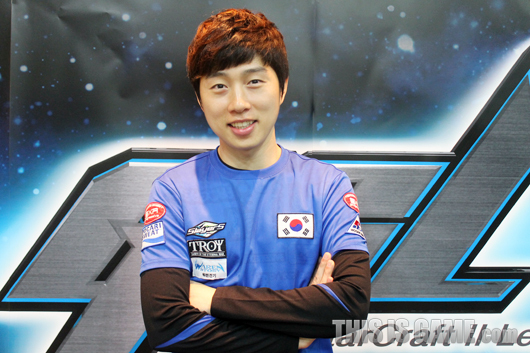 After Creator, there isn’t another Protoss. It looks good. I want to thank the Zergs on my team who helped with practice. The builds I used in Sets 1 and 3 were given to me by Alicia and Crank. They were a big help. I also want to thank Cella who accompanied me here today. 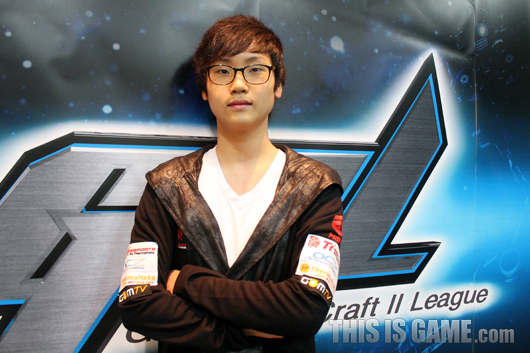 I’ve fallen to Code A but I will quickly make it back into Code S.
This is your first win in the GSL in a long time. How do you feel? It must’ve been a month since my last time at the studio. I watched the Code S games at home and felt sad that I was being forgotten. Coming to Code A in such a long time, it doesn’t even feel like I am playing in the GSL. I want to post great results soon and return to Code S. I was a little bit nervous playing for the first time in a long time. You joined a new team. Has much changed? Material wise, I am very well provided. The CEOs of the team are very passionate so they take good care of us. However, after spending so much time in a training house, playing by myself was difficult. I’m worried that I may be falling behind. I need to find a way to post good results. After the move, I played overseas only and didn’t do so well so I couldn’t make my presence known to the fans. Killer is playing in the MVP house. He’s definitely improved since he joined the house. I am seriously considering it myself. I need to talk it over with my team. We need to think of MVP’s situation also. However, lately my health is a bigger concern than practice. After attending MLG, I couldn’t exert much force on my wrists. My desk and chair must have been the culprits. I should find a stable training environment by myself or join the MVP house. You gave up one set today. Was there a moment of crisis? I suspected that the Protoss had taken a hidden third but I couldn’t scout it out. I played while thinking something was off but my control wasn’t good because of my wrist. Then, since my opponent kept playing without getting any counters for the banshee, I went for an all or nothing strategy. I am disappointed since these weren’t great games. Did you have a chance to talk to many of the complexity members? Once I joined, I attended a lot of foreign events and had many chances to talk to them. They were nice. I haven’t had a chance to talk to Nada yet so that’s regrettable. I hope all the team members soon get a chance to get closer. If Nada is watching, I hope he makes time for a meet up with me. I had a lot of trepidations about the future at the time so I wasn’t concentrating. My practice time decreased a lot as I left the SlayerS house too. It was regrettable since I couldn’t concentrate. Can you get back straight into Code S this season? That’s the goal. But first, I should take care of my health. Just last month, I attended four foreign tournaments and that seems to have taken a toll. I should have taken a break but got greedy so my wrist has gotten worse. I will prepare for the games once I’ve rested well. I think this is my first interview since leaving SlayerS. I feel like I didn’t leave the team without causing some trouble so I am sorry to the team and my ‘dong saeng’s (T/N: Korean term for juniors). I hope my SlayerS ‘dong saeng’s do well. I also want to thank Complexity for taking great care of me. How does it feel to advance to Round 2 of Code A? In my practice for the games today, I lost almost every single game. This made me feel that I may be getting eliminated today. However, the match turned out better than expected. I am happy (T/N: teehee). Lately, you seem to have run out of steam. What’s the problem? My style is too safe. As my style becomes exposed, I get countered and lose. It did seem like you were trying to diversify your style a bit. So far, it hasn’t worked so I think I need to work at it. I worry sometimes if I’ll just forget what I used to know and it’ll be neither here nor there. Today’s maps were heavily Protoss favoured, so much so that Choya was very confident. The maps didn’t matter. It was the fact that I lost a lot in practice that worried me. It’s like I worked myself into a knot while practising. The long duration of practice seems to have been the problem. IM’s had some great news lately. How is the atmosphere? It’s much better. Before the announcement, there was some apprehension. Afterwards, it’s become a lot more stable. You fell in Up and Downs last season. No lasting effects from that? I was in panic mode for a few days (laugh). I kinda felt numb. I went 1-4 and the games were really bad. You are taking on SlayerSRyung in Round 2. I have confidence. Lately, I’ve changed up my TvT style. Now, I do builds other than mech. I want to thank Ready, Younghwa, Seed, Anyppi for practising with me. I also want to thank dreamertt and the coach for their advice. Lastly, I want to thank our sponsors: LG electronics, Googims, Coca cola. Damn so quick lol, thanks for this. Holy lighting speed. No wonder your name is "storywriter". Creator is a beast with 80% winrate in GM. Nice job on the quick interviews! Awesome work! Cant watch because of finals week but I'm glad I can read these during study breaks. Thank you very much! weather in Sydney's been insane lately. I want to thank TSLPunish and TSLCenter who helped with practice. I hope Protosses in ro8 Code S do well. Thanks for the translations though =D! Why there is Boxer interview? Boxer lost his match..
Because he's BOXER. and no he FORFEITED due to INJURY. Sorry, there isn't one as far as I'm aware. All four interviews (including boxer's) now up. See you all in a few hours time.